These take several forms depending on the desired application. We offer three wall brackets, each made specifically for our door bells, meditation bells, single tone and small to medium multi tone wind chimes and temple bells. 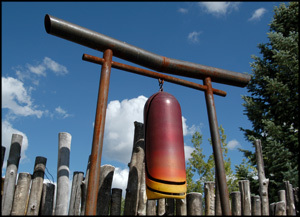 We also make floor stands for our meditation bells and Torii arches for our temple bells and multitone wind chimes. Our torii arches, or torii gates, come in several sizes and either as "planted" or "footed", depending upon your needs. Please contact us in matching your bell to the support that best serves your needs.